NewCook - The easiest way to start your food blog. We take care of hosting, affiliates links, ads and provide you with a beautiful recipe editor so you can focus on what you do best. 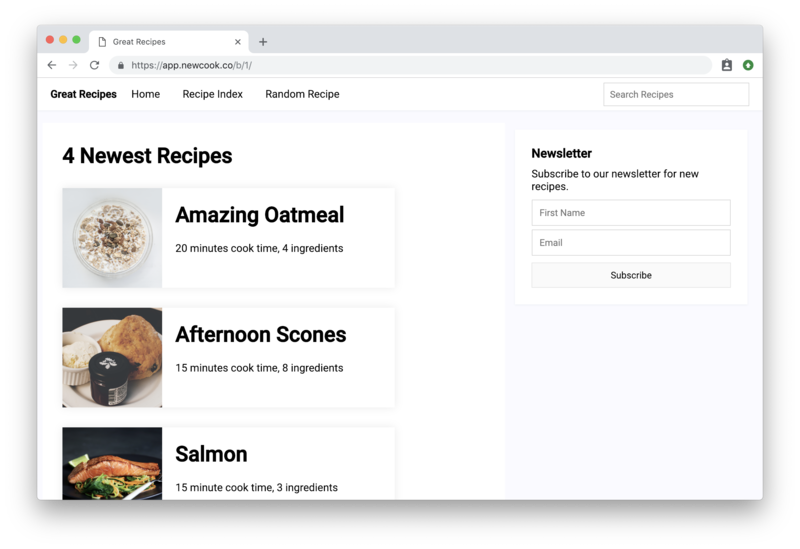 With delightfully simple recipe creation tools turbocharged with great SEO, integrated social sharing, a powerful Recipe index and many more features, you will spend more time writing recipes than tweaking your blog’s code. Never get overwhelmed with too much data and complex analytics. With Cucumbertown, you get precise and to the point data to monitor your content closely. We even give you projections on traffic trends to keep you focussed! Blogs come with monetization features such as affiliates, display ads and premium subscriptions. Happiness is, watching our bloggers earn tens of thousands of dollars every month. Want to check out a demo blog from NewCook? Look at Great Recipe, our test blog.